Providing a single cheese blend as a "recipe" is somewhat odd to me. The one I provide here is simply a suggestion based on our experience. So, it's a good "jumping off point", nothing more. Moreover, my wife and I live almost within walking distance of Colby, Wisconsin. That's smack dab in the middle of cheese country. It's hard to match our sources. We normally buy our cheese direct from Bletsoe's which is a 15 minute drive from our house. Their store is attached to the cheese "factory". And, you can actually watch the cheese making process through a window in the store. They make an excellent mozzarella which is very similar to the renowned Grande cheese. Grande is the mozzarella used by 90% of New York pizzerias. By the way, Grande is produced just south of Green Bay. Yup, most New York pizza cheese comes from Wisconsin, not New York. Again, it's hard to match our sources. Now that I have my bragging done, let's get back to pizza making. I guess the appropriate phrase for cheese is "whatever floats your boat". But, I will make a pitch for grating your own cheese. Don't use a grated pre-pack. Even the best sealed pre-pack allows drying and oxidation of the product. And, some of those cheese packs are made from cheese re-formulated just for packaging. It just ain't worth it. 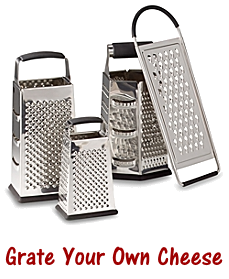 Grating cheese is simple and you can make the blend that is best tasting to your palate. That being said, there are a few generalities that apply to pizza cheese. First, mozzarella is king. Almost every cheese blend I've seen has a mozzarella component. Second, some cheeses weather the baking process better than others. For example, Parmesan and Romano lose their flavor in baking. Another example, Cheddar will separate (oil-out) during the bake (which some pizzerias actually like). The third thing to consider regarding cheese is how well it's works and plays with others. That is, some cheeses just plain overwhelm others in the blend. Come to think about it, I don't think I've ever seen a cheese blend with a Limburger component. But, someone must have tried it. So, without further distraction, here's our suggested cheese blend. It's simply 25% Asiago, 25% Provolone, and 50% Mozzarella. The hardest to find of the three is Asiago. Again, I have to make a smirking apology about our sources as Asiago is produced in Antigo just a few miles from our home. But, give it a shot, with modern distribution systems, you may find Asiago at your local grocery. Want to learn more about cheese? The Wisconsin Milk Marketing Board has an excellent website devoted to Wisconsin cheeses. It's a very good place to start. It oftens seems like research funding goes for studies that only prove what's intuitively obvious. Our reaction, of course, is "whatever were they thinking?" or "they spent money on THAT?". Well, in this New Zealand study we can see a very practical use of funds. Afterall, what's more important than pizza research?